I’ve written before about the distinction that must be drawn between a documentary and a piece of entertainment, and how some purported documentaries fall much more in the category of the latter than the former. A good documentary should investigate, educate, explore, expose, and along the way, entertain. But it should not put entertainment above education, and while Enron is a good documentary, it too often strays from the path and becomes enmeshed in attempts to charm the audience rather than present hard solid facts. Not that facts aren’t presented here–plenty of them, to be sure, make up vital portions of the movie. 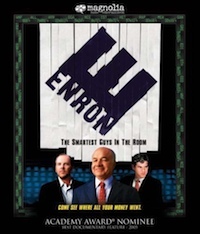 There are interviews throughout the movie with several individuals who worked at Enron as well as Bethany McLean, the reporter who broke the story of Enron’s scandals in 2001 (as well as co-author of the book on which this movie is based), corporate whistleblower Sherron Watkins, and even Gray Davis, the former governor of California. Snippets of congressional hearings, particularly those involving Jeff Skilling, the president of Enron, are revealing and sometimes tough to sit through, as we watch him dance around the truth and even outright lie to his inquisitors about what happened at Enron and the key role he played in the downfall of the company. Aside from the interviews, Alex Gibney, the director, does a pretty good job of using archive footage, newspaper and magazine articles, and other sources to document the rise and fall of one of the country’s largest and most powerful energy companies. More importantly, I have a much better sense of what happened during the downfall of the company, and why it happened. Where the movie falls apart, though, is in its presentation of all the material. Whereas master documentarian Ken Burns takes a slow, careful look at his subjects, lets interviews clips go as long as they need to, and allows the material itself to carry the viewer through an (often very long) film, Gibney has a very MTV-style approach that just doesn’t quite work as well. Interviews and archive footage are often inter-spliced with TV clips, rock music, and created bits that strive to capture the short attentions span of a generation weaned on Michael Bay-style editing. One segment, in discussing the excesses of Enron corporate trips, uses clips of dirt bikers performing X-games stunts in the desert while the narrator describes how Enron execs would sometimes go ride motocross to help build teamwork and leadership. I’m no dirt biker, but I’m pretty sure Ken Lay and Andrew Fastow wouldn’t launch themselves 20 feet into the air while doing backflips. Time and time again Gibney uses this type of editing as he explores the depth of the Enron bankruptcy rabbit hole (particularly in an entirely gratuitous segment discussing the after-hours trysts of executive Lou Pai) and I found it to be distracting and unnecessary. The story of Enron’s collapse is wholly interesting and engaging by itself, and had this movie stuck to just the facts, ma’am, I would be able to highly recommend it. As it stands, though, I would say go give it a watch, but maybe read the book instead.